This project examines the experiences of Latina immigrants suffering from domestic violence. 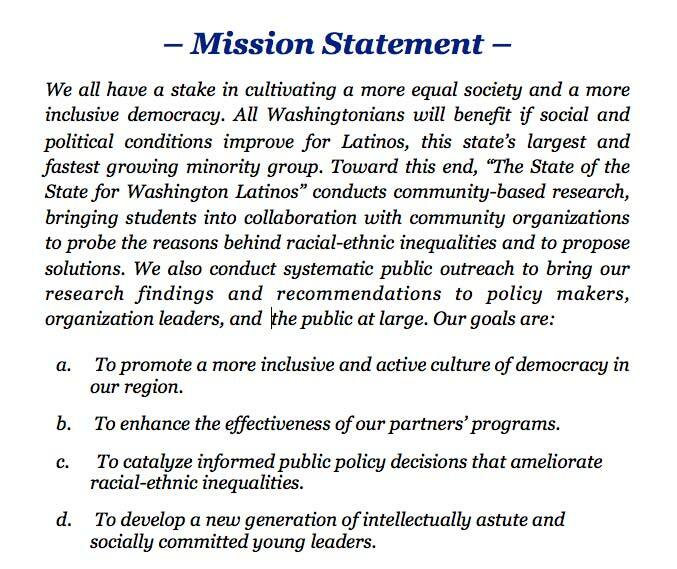 How can Washington state improve its domestic violence response network for Latina immigrants? Methods: In order to carry out a comprehensive report the voices of survivors must be included on top of the reports and findings I used from state agencies, social service agencies, and non- governmental organizations. I first cover and analyze theory and literature on domestic violence within the Latino immigrant community before analyzing the barriers specifically within Washington state’s domestic violence response network. I then address the themes and concerns detailed in the interviews before finally outlining recommendations to improve Washington’s domestic violence response network. Findings: While the Hispanic rate of spousal violence is 54 percent greater than that of non- Hispanic whites, both the Benton/Franklin county and Walla Walla domestic violence shelters have more non-Hispanic white clients than Hispanic clients. It is thus apparent that Latinas are facing barriers that are preventing them from seeking services in the community. From the literature and from the interviews I found that Latina immigrants are often forced to be dependent upon the male in the household due to language barriers, lack of education and job training, legal status, and an absence of a strong familial support system in the surrounding community. Abusers use mechanisms of power and control including isolation, emotional abuse, economic abuse, sexual abuse, using children, threats, using citizenship or residency privilege, and intimidation. All of these factors serve to isolate the women. There is a deficiency of domestic violence training for law enforcement and judges, and outreach from domestic violence services remains slim largely due to insufficient funding. Recommendations: We need to move the issue of domestic violence within the Latino immigrant community from the private sphere to the public so that the problem can be politicized and then targeted for specific policy analysis. The barriers that Latina immigrants face require that Washington state increase funding for outreach and educational services for all parts of the domestic violence network, including law enforcement agencies, domestic violence services, schools, and the judicial system. The network of resources in Spanish needs to increase so that monolingual Latina immigrants can become aware of their human and civil rights and the resources available in the surrounding community in order to make safe judgments regarding how to best protect themselves and their children. Community Partner: Soren Rottman, Directing Attorney at Northwest Immigrant Rights Project (NWIRP), and Shamaine Daniels, Volunteer Attorney for NWIRP have helped provide the insight and resources necessary to conduct this research. Rottman put me in contact with domestic violence survivor Silvia in Pasco and Daniels put me in touch with Lorena Ault, Bilingual Bicultural Advocate for Domestic Violence and Sexual Assault Victims, Education and Prevention Specialist at Walla Walla’s YWCA.